The person who can be seeing this web and reading these lines without never being inside a Gaiata, he or she could be thinking what is the sense of working in their free time, (sure they have just a little time free) inside of a Gaita comission as our one named Sequiol. Maybe we should start be explaining what a gaiata is. 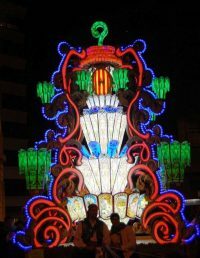 The Gaiata is the best representative monument for the Castellon’s party .It is an explosion of light without the flame and the smoke, it is the best of our identity as a village. It is an artwork that each year the expert hands of our members of the gaiata start and elaborate it with their best energy and experience. Because an artist is the one that design the sketch, an artist is the one that elaborate from the sketch the plan and mesure the hands the fingers the centimeters all the material they are going to need to build their gaiata. The artist are the ones who coloured the crystal, the ones that prepare the electric lights with the most difficult changes of colours, the carpenters that make the different kinds of models of arms for the lights that make the sensation that it is moving, all these are made by all the persons that each friday go to work on it in the warehouse where all the Gaiatas are kept, there they made it grow up and they give life to our Gaiatero monument. Gaiata is also the people that has to prepare all the Presentations in the “Palau de la festa”, which design the stage, the person who choose the music, the lights and the words they have to say in the speech, also the persons that organize the how the people has to be seatted which is the protocol, the persons that help the guests to get to their places, the other persons that work with the flowers and the presents so everything is nice for all them. The persons who take care about the bands and the insignia, so that all of the persons that are inside can see how much they work to let the things perfect for them because we are very proud of what we do for the others and for our partners too. The Gaiata is also the persons that are in charge to write each year the “Llibret”, there, they included the acts programmation of the big and great week of the “Magdalena” in it. Also it is included all the activities that our cultural associaton makes and the ones that we participate in it. In the “Llibret” we present to our Boys and Girls that they are dressed with our typical dress which are :”Castellonero” or “Castellonera” and “labrador” or “labradora” these typical dresses represent our elegancy because we are proud to dress with the typical dress. Also in the “Llibret” each year our writers write articles with much love about our town, our parties and traditions and also about The “amor pairal”. Gaiata are the friends we keep in our web and they update the contents, the ordinaries and extrordinaries activities of each day and keep us informated in any moment to our partners, friends and any person that come inside to our web site. Gaiata it is a soccer team, that we play to get fun and to build an excellent work in the Gaiata. Each weekend it is like we are playing the champions league. Gaiata is the traditionals group of dancers that each friday practice the “bolero”, “la jota” and “Les marineries”, and in each show they made we feel very proud of our group of dancers. Also we are so proud of the “dolçainers” and “tabaleters” they play the songs to the dancers, the songs they have to dance. They play very difficult compositions. Gaiata are the people that make us laugh with their theater displays in our language that we have here which is the “valencian”. As the act, it is very funny when they go to act and to work in the representation. to the others Gaiatas to invite us so we can meet more people, and we can have more friends. Gaiata are the partners that let us get the inspiration and the happiness to continue with our work each year. Because with their economic effort and their emotional support they help that the Gaiata continues year over year… And they transmit us their happiness for the well done things. Of course, Gaiata are also our kids (boys and girls) that are our youngest representatives. They made our “Cau” (the place where we meet all fridays) as a soccer place or their place to dance and play games and of course a place to talk and have fun with their friends. Copyright © 2019 Sequiol.es - A.C. Gaiata 15 "Sequiol".